Installing a swimming pool in your backyard is a major investment. When you make a decision that big, you want to make sure you pick the best contractor for the job. 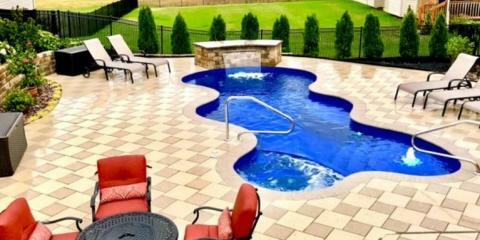 Destination Pools in Columbia, IL, will help you pick the shape, size, and style that fits your specific vision. Since 2008, the family operated company has been committed to offering customers a total package service for their outdoor spaces, including pool construction services you can rely on. Specializing in every aspect of the pool and spa industry, Destination Pools provides a variety of services, from guaranteed quality in-ground swimming pool installation to efficient pool repairs and regular maintenance. They offer fiberglass pools of all shapes and sizes, concrete pools that will withstand any manner of wear and tear over time, and vinyl panel wall pools that are backed by the industry’s best warranties. After installation, they can fit you with the best pool and spa equipment, including IntelliTouch pool and spa control systems, Pentair salt generators, and Pentair heat pumps. They’re always available to answer any questions you might have about your pool or equipment, and they’ll come to perform pool repairs, maintenance, and liner replacements whenever you need. Following the completion of your swimming pool installation, you might have to make some adjustments to the rest of your backyard to match. With Destination Pools, you can expect not only complete swimming pool, spa, and water feature design and installation but expert hardscape design and construction services as well. They’ll install the perfect pool deck or extended patio to complement your new pool. When you decide you want a pool or spa, choose to work with the best in swimming pool installation and maintenance. Call Destination Pools today at (618) 281-7776 or visit their website to browse their different pool models.